I took some time off of packing and made this card, just love these sweet little images from Magnolia. I have a friend who recently became a Magnolia Designer on 3 different Magnolia Design Teams and I wanted to show her my support by entering in the challenges! Hi Karen! I colored my image in Copics and used the "Forever Best Friends" sentiment from the same "Animal of the Year" Magnolia collection. My image is framed with Joy Crafts 6002/0257 square frame die to and of course I Frantaged it a bit. The left side of my card has the Magnolia So Wrapped Heart die with a crocheted pink flower and Prima zipper on it. Underneath the pink flower are 2 colors of fringed tulle to make it more girly. 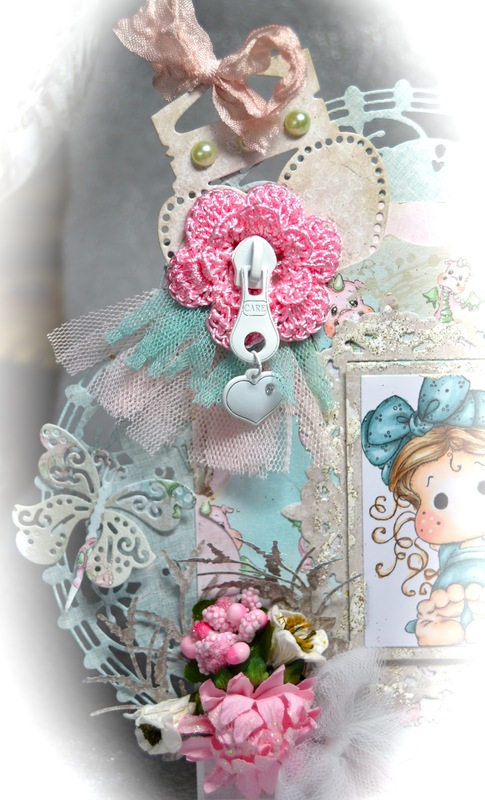 The Joy 6003/1002 die is also on the side with another Magnolia Doohickey Butterfly die. I Used the leaves included with the Joy 6002/0257 square frame die to make the feathery leaves in my florals on the bottom of the card. Here is a better look at the leaf that comes with the Joy 6002/0257 Square Frame die and a Prima flower. Thank you so much for visiting my blog today, I really miss crafting and it will be quite a while until I will be back at it again. I am enjoying your crafts and wishing you all a safe and happy Spring! This is just so beautifully bo ho chic. Just love all the beautiful details. Your card is so creative ! Gorgeous work Kelly and I can see the packing and moving hasn't affected your card making skills. 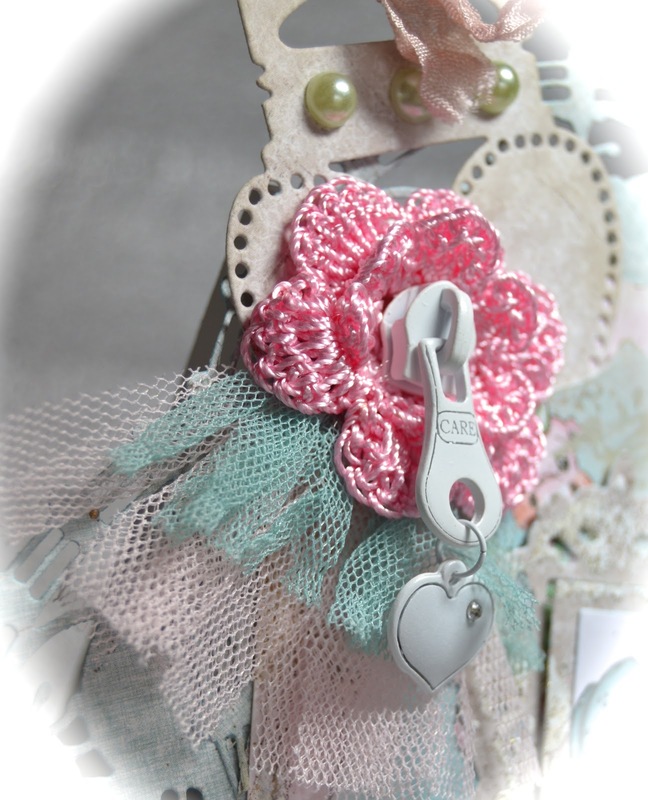 Fab colouring and such a cute idea to use the zipper pull in the flower center. Isn't this the cutest collection ever???? Still waiting for my kit!!!! I love, love your card, Kelly!!! Gorgeous dies, details, design and a beautifully colored image. Sheer perfection, my friend! what an adorable image!!! And you colored it so beautifully!!! LOVE all of the flowers, and the balloon and the little zipper on the crochet flower! Oh my goodness!!!! Hello Kelly! Wowzers this is one gorgeous card. Lots of yummy dies and fabulous coloring too! Only you can manage to get ready to move and still create such delicacies. Ok country sista keep up the fantastic work! Saw this lovely card at RB....joined your followers here! One of the prettiest cards you have ever made. I sure did enjoy our talk yesterday and do miss you a bunch! I know what you have on your plate - just the emotional journey would be enough to exhaust anyone!! I love your card, very pretty. Thank you for playing at Magnolia Forever. So so cute, Kelly - the image is a treat (and brilliantly coloured as ever), and I just love all the pretty framing and embellishing - a delight. Oh, I hear you on the pain of packing - my craft stuff was left until the last possible moment as I couldn't bear the idea of not having access. Good luck! wow. this is an amazing card! Great colours and so many lovely die cuts!